It’s no longer news that MTN has acquired Visafone and as such, MTN now owns Visafone. In a bid to keeping Visafone users within the new network service, it is advised that Visafone subscribers should migrate their line(s) to the MTN Network and the process is pretty simple. No, migrating an existing Visafone sim to an MTN network won’t make the Visafone number void. The numbers will still be intact. It’s just a change of network. See it as porting from one network to another which doesn’t in anyway, affect being reached with the existing number. 4. The Migration process and New SIM Card are FREE of charge. 5. 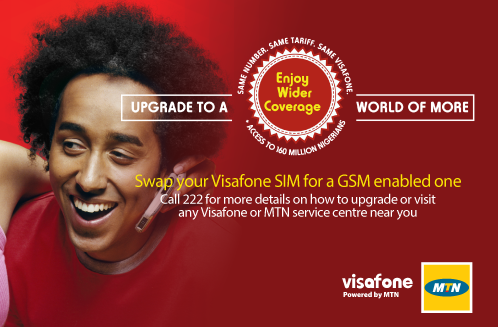 Your line is expected to be active on the MTN Network within 24 hours of activation. 6. You cannot send someone to do the migration for you. 7. You will be able to access and retain your services on MTN after Migration. MTN GSM network support both Voice and Data services. 8. You’ll not be able to retain your VISAFONE airtime and data balances after the migration to MTN but you’ll be duly compensated after your migration is done. 2. An active VISAFONE MSISDN. As we probably all know, Visafone used to be a CDMA network. Migrating to MTN automatically makes it a GSM network which opens doors for more possibilities.